Sunset Showdown Video Slot Review - Casino Answers! Sunset Showdown is a 5-reel, 25-line video slot developed by Microgaming, featuring a wild symbol, scatter wins, multipliers, a free spins feature, a gamble feature and a bonus game. You can play the Sunset Showdown video slot at Bovada. Sunset Showdown is a penny slot. Coin values on the Sunset Showdown slot machine are $0.01, $0.02, $0.05, $0.10, $0.20 and $0.25. You can select up to 25 paylines and 1-10 coins per spin. By playing the $0.25 coin value with all 25 lines enabled at 10 coins per line, you can play the maximum total bet of $62.50 per spin. This is a decent betting range for most online slots players. To play the Sunset Showdown video slot, select your bet and press either the “Spin” or “Bet Max” buttons. The top-paying symbol on the Sunset Showdown video slot is the Cowgirl symbol. 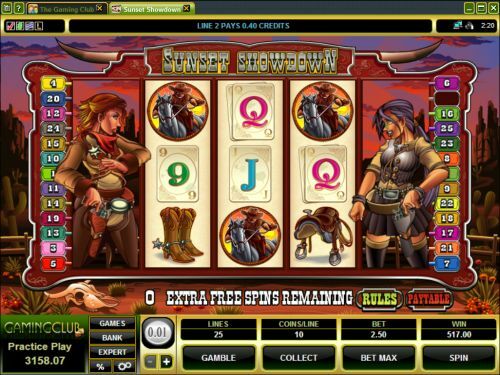 If 5 Cowgirl symbols appear on a selected payline, you will win the 7500 coin top jackpot. The Cowgirl symbol is a wild multiplier which will substitute for all symbols except for the Scattered Revolver and then double your winnings on the winning combination. The second highest paying symbol is the Cowboy symbol, which can pay out up to 1250 coins. You can gamble your winnings on the Sunset Showdown slot game by pressing the “Gamble” button. You can double your winnings by choosing Red or Black correctly. You can also potentially quadruple your winnings by choosing one of the four card suits. You can exit the gamble feature on Sunset Showdown at any time by hitting the “Collect” button. When the Cowgirl wild symbol appears on reels 1 and 5 at the same time, the two Cowgirl symbols will expand to cover the entire reels. The remaining reels will be re-spun three times. The free spins feature is played at the lines and bet of the triggering game. Free spins feature wins are added to payline wins and scatter wins. Get some extra wins from this feature when you play the Sunset Showdown western slot at Bovada! Payouts are made according to the Paytable. Payline wins are multiplied by the bet per line. Scatter wins are multiplied by the total bet. Scatter wins are added to payline wins. All symbols pay left to right, except for the Scattered Revolver symbol (which pays any). Highest win only on each selected payline. Coinciding wins on different selected paylines are added. The Cowgirl symbol will substitute for all other symbols except for the Scattered Revolver symbol. The prize is doubled when the Cowgirl symbols substitute in a winning combination. 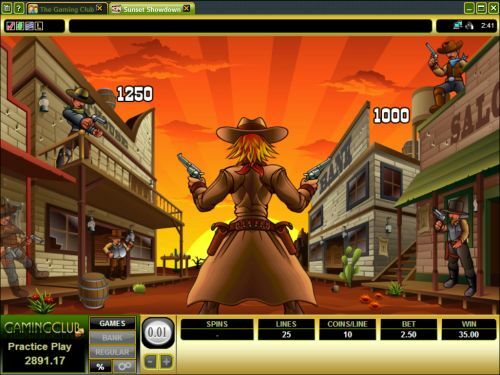 The Sunset Showdown online slot has an autoplay feature with advanced settings. To use the autoplay mode on the Sunset Showdown online slot machine, you must hit the “Expert” button. You can now play 5 or 10 autoplay spins. For advanced settings, hit the “AutoPlay” button and you can now play 5, 10, 25, 50, 100, 250 or 500 autoplay spins and stop autoplay if a win exceeds or equals $100, $500, $1000, $5000 or $9999. Autoplay will stop on any feature contained in the game. You can stop autoplay at any time on the Sunset Showdown slot game. The Sunset Showdown video slot has everything the casino player wants in a great video slot. You’ve got a great top payout, a bonus game, free spins, a gamble feature and much more all wrapped up with an attractive presentation. If you’re a cowboy or cowgirl who longs for the days of the Old West, watching Clint Eastwood and John Wayne films and polishing your gun collection, you will enjoy playing the Sunset Showdown video slot at Bovada! Are players from the United States allowed to play the Sunset Showdown casino game for real money? No, American players cannot play the Sunset Showdown online slot game for real money at this time. For an alternative, we suggest you read our Western Wildness Video Slot Review or play it at a Rival-powered casino like Bovada.